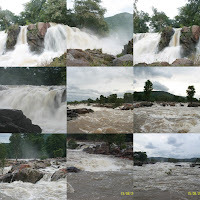 Hogenakkal falls is in Dharmapuri, Tamilnadu; around 180 km from Bangalore. The drive from Bangalore to Hogenakkal falls took us through Hosur - Krishnagiri and Dharmapuri. At Dharmapuri take a right to the State highway that leads to Hogenakkal. Driving time was around 4hrs without any breaks except an "Air Break" offered by a lorry and helping out a group of bikers, one of whom skidded out of the road and was more shaken than bruised. 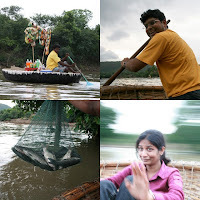 As soon as we got out of the car, we were hounded by numerous offers for fish fries, oil massages, and boat rides. We settled for a 1hr boat ride. The boatman risked his life by letting us try our hand at rowing, showed us how the local fishermen kept excess fish wrapped in a net and submerged in water, and gave us a mighty spin. If you are feeling light in the stomach (and heavy in the wallet) a floating shop can help you out with titbits to munch & drink. Hogenakkal falls gets its name from the local language term for "Misty Rocks". It is a series of waterfalls and it usually looks as if a big earthquake has split the earth into two and all the water of the seas will get flushed into the crack. But what we got to see this time was different. It had been raining quite a bit in these parts recently. While we did expect to see lot of water, we never expected so much of it. The mighty waterfalls were all submerged under water and water was just flowing over the rocks and the gorge. There were no high cliffs from where kids jump into the water. There were no waterfalls that you can drive your coracle under and get drenched. All that was there was a sea of water with swift currents. As if an element of nature has been tamed by another wilder one. There was one place near the bridge and watch tower where you could see a short but mighty water fall. The place was wet and misty, true to its name. By the time we got out of water, it was a solid 3hrs and it was getting dark. Time flew... We thanked the boatman, watched him wash his coracle and carry it up to the shore as we leisurely walked back to the car. The drive back was faster and we reached back home before 11PM including a dinner break at Hosur. whatta a lovely place! please temme u had the fresh fish fry there.